The ATX230E is one of the most versatile models of Electric vehicles manufactured by Alkè. Though extremely compact (just 3.5 m long and 1.27 m wide), this model is extremely robust and can be equipped with sprayers and tanks of up to 600 litres. In addition to being completely respectful of the environment, thanks to its entirely electric motor, the ATX230E model is one of the company's most reliable and silent Electric vehicles. This vehicle boasts an optimal autonomy of almost 75 km, and the batteries only require about eight hours to be fully recharged. These models of Electric vehicles are capable of handling any terrain with maximum ease and agility (including dirt roads), and can even tackle steep grades of up to 35%. The ATX230E can be equipped with a powerful sprayer, which is extremely useful for performing maintenance activities in parks and gardens, as well as any other activities that require a strong jet of water (e.g. street cleaning). The ATX230E is ideal for any activity that requires large amounts of water, including the maintenance of large green areas like public gardens, parks, sports fields, and forested areas, as well as vegetable gardens and orchards. The Spray gun is perfect for watering plants, even those which are located in hard to reach areas. This is owed to the ATX230E model's ability to easily handle rough and uneven terrain. The water dispensing pipe has a maximum extension of 50 metres and can be wound up with maximum ease. 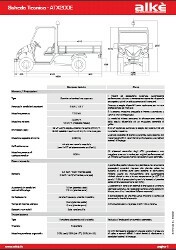 It should however be noted that these zero-emission Electric vehicles are approved for road use (European motorised vehicle category L7e: heavy quadricycles). 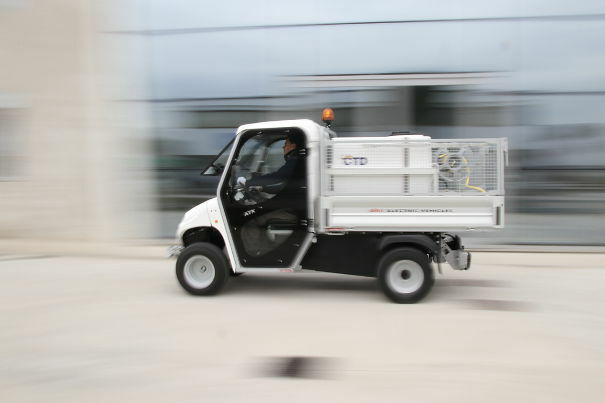 The Spray gun can be used for any application that requires a heavy stream of water: therefore, the vehicle can also be used for street cleaning operations, for example. 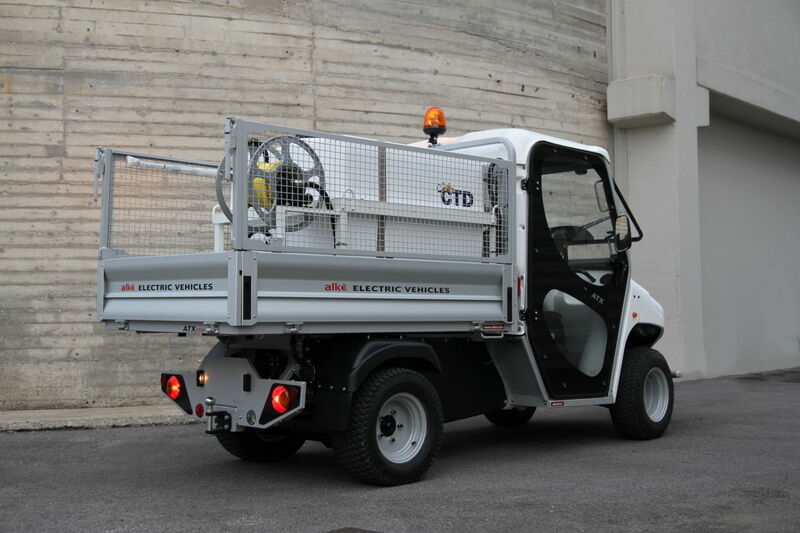 Other noteworthy features of these Electric vehicles equipped with sprayers include their maximum speed of approximately 35 km/h, and their towing capacity of almost 3,000 kg in private areas. The control panel has a display that shows the batteries' current charge status. The suspensions and braking systems are of optimal quality, as is the extremely robust frame. The interiors also offer excellent comfort. The ATX230E model is also extremely easy to drive thanks to its soft and precision steering, and its highly responsive motor.